If you asked a guy what he prefers – heavy makeup vs no makeup, and 9 times out of 10 you’ll hear that no makeup is way more attractive and appealing. Why? Because, it’s the natural beauty. But we know that it doesn’t come naturally all the time, right? Not even talking about days when you just don’t want to dedicate 30 minutes to your eyeliner alone. Maybe you’re just not into bright, colorful looks or perhaps you want to look neat and polished for a job or an interview. Either way, natural-looking makeup is an option you’ll want to have in your arsenal of makeup looks. It’s an easy style to wear as well — you won’t have to worry about touch-ups or getting red lipstick on your teeth. Follow our tutorial to get a flawless, natural makeup look in no time. Feeling a little uncomfortable? Make sure you’ve checked The Makeup Basics: How to Wear Makeup If You Have Absolutely No Clue What You’re Doing first. Take good care of your skin, and you won’t have to cake on the foundation. This means (and is not limited to) eating well, drinking lots of water, always using sunscreen, using a gentle cleanser and a mild exfoliant (if necessary). And always, always, always moisturizing. Not only will your makeup apply better, but you’ll be comfortable using less of it. If you can, apply your makeup next to a window. Have you ever put on makeup under warm fluorescent light bulbs only to step outside and realize that what you thought was a “light wash of bronzer” looks way too dark and completely unblended? While it may be convenient to put your makeup on in the bathroom, try to apply it next to a natural light source. If you’re going for a natural look, you’ll want to use a lighter coverage foundation. What type of foundation you use will depend on your skin type and personal preferences, but generally speaking, foundations with a natural finish include BB and CC creams, tinted moisturizers, mineral makeup, and light coverage liquid foundations. It is not only important to choose the right product but also select the right tool. To best apply mineral foundation, take a kabuki brush and pick up the product. Tap off the excess product on the side of the container and carefully press the brush onto your face. Start with a light hand — you can always build coverage if you need to. If you’re applying liquid foundation, you can use a beauty blender or any cosmetic sponge for that airbrushed look. To use a beauty sponge, dampen the sponge and squeeze out the excess product. Apply a small amount of foundation to the sponge and stipple the product onto your face using a bouncing motion. Use the pointed tip for smaller, harder to reach places like your under-eye area. If your foundation applies best with a brush, use a medium-sized fluffy brush and apply the product to your face in light, swirling motions. Start in the center of your face and blend outwards — the last thing you want for a no-makeup makeup look is a sharp contrast between your face and your neck. Lastly, there’s one tool you can always use in a pinch – your fingers. This is the cheapest and easiest option and will waste the least amount of product. Tinted moisturizers and BB/CC creams apply just fine using clean fingers, but you can also apply them with any of the tools above. Pro Tip: Those with oily skin may need to use primer and/or set their foundation with a translucent powder. Concealer is a huge part of no-makeup-makeup. To get that flawless, natural look, you can cover up your dark circles and any hyperpigmentation or blemishes. You can apply concealer before or after your foundation, depending on personal preference. To properly conceal a blemish, make sure you moisturize the blemish first so that the dry skin around it will not flake. Once that’s set, take your favorite concealer and pat it onto the blemish using your ring finger or a clean concealer brush. Do not rub the concealer in; instead use short, dabbing motions. Lastly, add a bit of translucent powder over the concealed blemish to keep it concealed throughout the day. Try not to glob on the concealer – dab on a small amount and blend it out. You can always add more if you need to. For under eye circles, be sure to use a shade that’s an exact match for your skin tone — if it’s too light, you may end up with reverse raccoon eyes. There’s no need to always create a giant triangle of concealer either – sometimes, a dab of concealer on both sides of your eye blended towards the center is all you need. Again – pat, do not rub. For this look, we won’t be messing with your natural brow shape too much. If you like your brows au naturel, there’s no need to use the product. However, if you have longer brow hairs, brush them into place with a spoolie. If your brows are particularly stubborn, you may need some brow gel to set them. If you have sparse areas that need to be filled in, take a powder or pencil just a shade lighter than your natural eyebrow color and lightly fill them in with quick, short brush strokes. 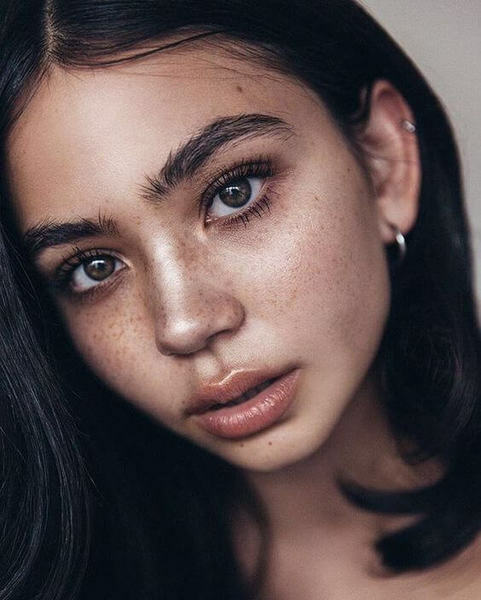 Now is not the occasion to draw on those perfect Instagram brows; since you’re keeping the rest of your face natural, heavily filled in and outlined brows may look too dramatic. If you need to, sweep a light, natural-looking blush on the apples of your cheeks to put some of that natural flush back into your face after applying foundation. Cream blushes are ideal for this type of look because it’s harder to go overboard with color than with powder blush. Plus, you can apply it with your fingers, which gives you good control and eliminates the need to wash another brush. Bronzer is optional, but if you are going for a natural, sun-kissed look, take a medium-sized angled brush and swipe a small amount of bronzer in the shade slightly darker than your skin tone onto your cheekbones. We’re not aiming for a Ru-Paul-worthy contour here, so use a light hand. The natural makeup look can be as intricate as you want it to be. You can spend 5 minutes or 50 minutes on your face and still look natural. The difference between the five-minute face and the hour long “I woke up like this” face usually lies in the amount of eye makeup you are wearing. You can rock something as simple as a quick wash of neutral eyeshadow and mascara, or contour out your crease and highlight your brow bone. For an easy, quick, and natural eye look, take a cream shadow in a neutral color and sweep it across your lid. If you regularly curl your lashes, do so now. Add a coat of your favorite mascara, and you’ll be good to go. If your eyelashes are already dark, skip mascara on the bottom lashes. If you have light skin and eyelashes, opt for brown mascara. If you want to spend a little more time on your eyes, black eyeliner is a quick and easy staple to any makeup look. It can be smudged into the lash line for subtlety. Alternatively, anyone with any skin tone can try a gray eyeliner for a look that’s not too harsh. However, if you’ve got light skin, eyes, and hair, consider using a brown eyeliner. Black eyeliner against light skin and eyes can be a bit too harsh for an otherwise natural look. Those with light skin and blue eyes may even want to try a plum or dark purple eyeliner. If you’d like to get a little fancy with eye shadow, pick at least three neutral shades that go with your skin tone: a highlight shade for your brow bone, a neutral shade for your lid, and a slightly deeper shadow to smudge into your lash line. Make sure there are no harsh lines in between any of the shades — take a fluffy blending brush and blend in small, circular motions until the colors seamlessly blend. If you are feeling particularly ambitious, choose a shade a couple of shades darker than your skin tone to apply and blend into the crease. This is a pretty yet uncomplicated eye look that is fun to do. To finish off your natural makeup look, top things off with a quick wash of color on your lips. If you want, you can choose a sheer lip color but better a shade that fades evenly. Otherwise, keep things natural and hydrated with some soothing lip balm.